A few days after the one year anniversary of the Fukushima disaster, nobody talks about it anymore. After all it’s “fixed”, and if it isn’t, the Fed will fix it. Remember in the New Normal nothing bad is allowed the happen. So for those who have forgotten, here is a reminder. 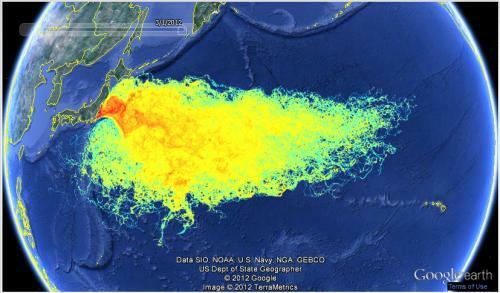 We use a Lagrangian particles dispersal method to track where free floating material (fish larvae, algae, phytoplankton, zooplankton…) present in the sea water near the damaged Fukushima Daiichi nuclear power station plant could have gone since the earthquake on March 11th. THIS IS NOT A REPRESENTATION OF THE RADIOACTIVE PLUME CONCENTRATION. Since we do not know exactly how much contaminated water and at what concentration was released into the ocean, it is impossible to estimate the extent and dilution of the plume. However, field monitoring by TEPCO showed concentration of radioactive Iodine and Cesium higher than the legal limit during the next two months following the event (with a peak at more than 100 Bq/cm3 early April 2011 for I-131 as shown by the following picture). Assuming that a part of the passive biomass could have been contaminated in the area, we are trying to track where the radionuclides are spreading as it will eventually climb up the food chain. The computer simulation presented here is obtained by continuously releasing particles at the site during the 2 months folllowing the earthquake and then by tracing the path of these particles. The dispersal model is ASR’s Pol3DD. The model is forced by hydrodynamic data from the HYCOM/NCODA system which provides on a weekly basis, daily oceanic current in the world ocean. The resolution in this part of the Pacific Ocean is around 8km x 8km cells. We are treating only the sea surface currents. The dispersal model keeps a trace of their visits in the model cells. The results here are expressed in number of visit per surface area of material which has been in contact at least once with the highly concentrated radioactive water.